The present invention relates to a film thickness-measuring apparatus suitably used for measuring the film thickness of an object to be measured, which is moved at high speed. Ellipsometry is generally used as a means for measuring the film thickness of a thin film having a film thickness of several 1,000 Å. According to this method, a change in polarization state when light is reflected by a thin film sample surface, i.e., ratio ρ of Fresnel complex amplitude reflection coefficient rp of one electrical vector component (p component) parallel to an incidence plane to Fresnel complex amplitude reflection coefficient rs of the other component (s component) perpendicular to the incidence plane is obtained by equation (1) below, and film thickness d is obtained in accordance with a predetermined function of already established reflection coefficient ratio ρ and film thickness d.
Since reflection coefficient ratio ρ is a complex number, two ellipsometric parameters, i.e., amplitude ratio tan ψ and phase Δ must be obtained. One of conventional means for obtaining these two ellipsometric parameters ψ and Δ at high speed is disclosed in U.S.-A-4,850,711. According to this means, linearly polarized light formed by a polarizer and having a predetermined azimuth is caused to be incident on the incidence surface of an object to be measured at a predetermined angle. Then, the light reflected by the object is converted into a plurality of light beams using a beam splitter section. The plurality of light beams are caused to pass through a plurality of analyzers having different transmission polarization azimuths, and are respectively focused by a plurality of focusing lenses at predetermined focal lengths. The plurality of light beams focused by these focusing lenses are detected by a plurality of photodetectors through pinholes located at the respective focal points, thereby outputting electrical signals corresponding to the respective light amounts/intensities. Then, the respective electrical signals from these photodetectors are subjected to a predetermined arithmetic operation so as to obtain two ellipsometric parameters, i.e., amplitude ratio tanψ and phase Δ. With this operation, two ellipsometric parameters ψ and Δ can be reliably obtained using a fixed optical system. The film thickness or refractive index of the object to be measured can be calculated on the basis of these parameters. is close to 0 when Δ is close to 0° or 180°, even if a small error is included in the right side of equation (2), an error in Δ becomes large, and hence accurate measurement cannot be performed. Quite similar problems exist with the film thickness-measuring apparatus as disclosed in Surface Science, Vol. 56, No. 1, June 1976, North Holland Publishing Co., pages 212 - 220; T. Smith, "An Automated Scanning Ellipsometer". The said apparatus comprises linearly polarized light forming means for forming linearly polarized light which can be incident on an incidence plane of an object to be measured at a predetermined angle; a plurality of analyzer prisms splitting the light reflected by the object into a plurality of light beams to pass at different transmission polarisation azimuths, respectively; electrical signal output means for outputting electrical signals corresponding to the light amounts/intensities of the plurality of light beams from said analyzer prisms; and an arithmetic processing section for receiving the respective electrical signals from said electrical signal output means and performing predetermined arithmetic processing for the electrical signals to obtain the film thickness from the amplitude ratio and phase of two ellipsometric parameters. Since the light forming means are designed to provide linearly polarized light, an accurate measuring of the film thickness of a transparent film formed on a transparent substrate is not possible, above all if the phase of the ellipsometric parameter is close to 0° or 180°. It is, however, known from the DE-A-26 16 141 to take advantage of arrangements providing the sine of the said phase in cases where the cosine would be close to 1, or the phase angles close to 0° or 180°, respectively. The apparatus according to the DE-A-26 16 141 includes a movable unit, and does not disclose or suggest techniques for extracting a plurality of polarized light components from light reflected from the object. It is an object of the present invention to provide a film thickness-measuring apparatus capable of accurately measuring the film thickness of a transparent film formed on a transparent glass substrate even if the phase of the ellipsometric parameter is close to 0° or 180°. According to the present invention, the said object is achieved by the measures as described in claim 1.
becomes maximum when phase Δ is close to 0° or 180°, Δ can be obtained with high precision even if phase Δ is close to 0° or 180°, and hence film thickness measurement can be performed with high precision. Figs. 9 and 10 show modified optical systems to be used in the embodiments of the invention, respectively. Embodiments of the present invention will be described in detail with reference to the accompanying drawings. Referring to Fig. 1, reference numeral 11 denotes a collimated monochromatic light source. Light emitted from light source 11 is formed into a linearly polarized light having predetermined azimuth ϑ by polarizer 1, converted into circularly polarized light through λ/4 plate 40, and is incident on sample surface 9 at predetermined angle φ0. Note that the incidence plane of sample surface 9 is parallel to the surface of the drawing and the light propagation direction is the Z direction. In addition, a coordinate axis forming 90° with the light propagation direction Z is defined as the P axis, and a coordinate axis perpendicular to the P and Z directions is defined as the S axis, so that the P, S, and Z directions constitute a right-handed orthogonal coordinate system on the incidence plane. All the polarizer and analyzer angles are set such that the P axis is 0° and the S axis is 90°. The light reflected (reflection angle φ0) by sample surface 9 is branched into three light beams by four optical flats (beam splitter sections) 13a, 13b, 13c, and 13d of an identical material and shape through aperture 12 for limiting beam size. Optical flats 13a to 13d are optically isotropic and transparent, and are fixed parallel to each other. The thicknesses and intervals of optical flats 13a to 13d are set such that multiple-reflected light is not detected. Of the three light beams, a light beam transmitted through two optical flats 13a and 13b and reflected by optical flat 13d is set for channel ch1, a light beam transmitted through optical flat 13a and reflected by optical flat 13b is set for channel ch2, and a light beam transmitted through optical flat 13a and reflected by optical flat 13c is set for channel ch3. The light beams for channels ch1 to ch3 become parallel to each other. Then, the light beams pass through analyzers 14a to 14c having fixed transmission azimuths α1 to α3, and focused by condenser lenses 15a to 15c having the same focal length. The focused light beams pass through pinholes 16a to 16c. After external disturbing light is removed by interference filters 17a to 17c, the resultant light beams are supplied to photodetectors 18a to 18c to be converted into electrical signals I1 to I3 corresponding to the respective light intensities. Subsequently, electrical signals I1 to I3 are subjected to a predetermined arithmetic operation in the signal processing circuit shown in Fig. 2, thereby calculating ellipsometric parameters ψ and Δ. Referring to Fig. 2, electrical signals I1 to I3 for channels ch1, ch2, and ch3 respectively output from photodetectors 18a to 18c are amplified by amplifiers 19a to 19c. After noise components of electrical signals I1 to I3 are removed by low-pass filters 20a to 20c, electrical signals I1 to I3 are supplied to sample and hold circuits (to be referred to as S/H circuits hereinafter) 21a to 21c. S/H circuits 21a to 21c simultaneously sample and hold the respective output signals of channels ch1, ch2, and ch3 using gate signal G output from microcomputer 22. The respective output signals from channels ch1 to ch3 simultaneously sampled, i.e., electrical signals I1 to I3, are supplied to microcomputer 22. Then, microcomputer 22 performs the following arithmetic processing so that ellipsometric parameters ψ and Δ are output from output terminal 23 as digital information. In addition, the digital information is output from output terminal 25 as analog information through D/A converter 24. Note that reference numeral 26 denotes a preset circuit for presetting each channel gain, specific values φ0 | σ1σ2 | and minimum light amount level I3min. where rp is the amplitude reflectivity of the P polarization electrical vector (in the incidence plane) in the object to be measured, and rs is the amplitude reflectivity of the S polarization electrical vector (in direction perpendicular to the incidence plane) in the object. In equations (6) to (8), tp' and ts' are the P and S Fresnel complex amplitude transmission coefficients of optical flats 13a to 13d, rp' and rs' are the P and S Fresnel complex amplitude reflection coefficients of optical fiats 13a to 13d, φ1 and φ2 are the phases of σ1 and σ2, and φ0 is the sum of the phases of σ1 and σ2. where signs "+" and "-" denote right- and left-circularly polarized light, respectively. where signs + and - have the same meanings as in equation (9). where signs + and - have the same meanings as in equation (9). In equations (9) to (11), K1 to K3 are the detector gains of channels ch1 to ch3, τ1 to τ3 are the transmittances of analyzers 14a to 14c and photodetectors 18a to 18c of channels ch1 to ch3, I0 is the intensity of incident light, and α1 to α3 are the azimuths of photodetectors 14a to 14c of channels ch1 to ch3. where φ0 and | σ1σ2 | are the specific values determined by optical flats 13a to 13d. In equations (18) and (19), φ0 is an incident angle. Therefore, two ellipsometric parameters ψ and Δ can be simultaneously obtained by correcting φ0 and | σ1σ2 | according to equations (16) and (17). In practice, φ0 is close to 0°, and | σ1σ2 | is changed depending on the incident angle of reflected light onto the beam splitter. The value of | σ1σ2 | becomes close to 2 when the incident angle is 70°. 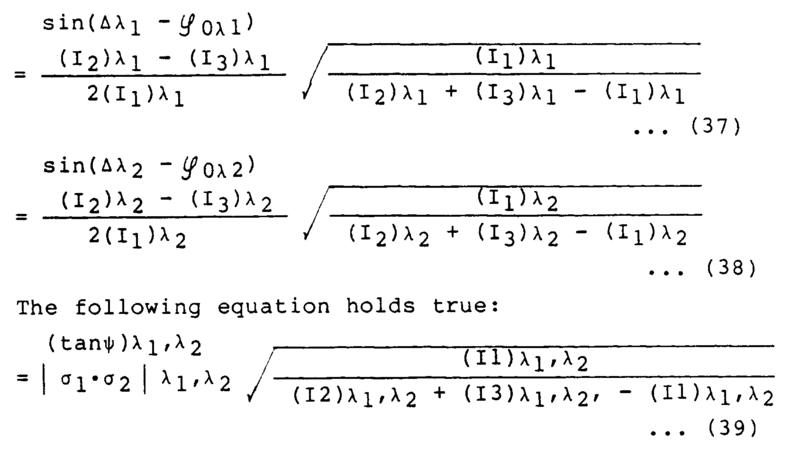 As is apparent from equations (16) and (17), since sin(Δ - φ0) and tanψ are obtained using outputs I1 to I3 as dimensionless values, and outputs I1 to I3 are simultaneously obtained, these values are completely free from the influences of changes in light amount due to a light source or an object to be measured. With this operation, when the object is tilted by 0.2° or more, reflected light is shielded by pinholes 16a to 16c, and hence the light amount level is dropped. Therefore, when one of photoelectric outputs I1 to I3 of the three channels, e.g., I3 is monitored, and then, lowermost limit level I3min is set and a condition of I3 < I3min is satisfied, monitored I3 is not used as a measurement value. By performing such a countermeasure and keeping the stability of each of photodetectors 18a to 18c to be 1% or less, a measurement precision of ±5 Å can be obtained. Fig. 3 is a flow chart for explaining an operation of microcomputer 22 in Fig. 2. Referring to Fig. 3, when the power is turned on in step S1, monochromatic light source 11 in Fig. 1 is turned on, and all the circuit elements in Fig. 2 are energized. In step S2, the contents of microcomputer 22 are initialized, and S/H circuits 21a to 21c are cleared by gate outputs G1 to G3 from microcomputer 22. At the same time, the values of each channel gain, φ0, | σ1, σ2 | , and I3min are output, thereby performing a preset operation. Upon completion of the initialization, the flow advances to next step S3, and output data I1 to I3 from the respective channels are sampled by S/H circuits 21a to 21c using sampling signal G from microcomputer 22. When the data sampling in step S3 is completed, the flow advances to next step S4, and minimum value I3min preset by preset circuit 26 is compared with output data I3 held by S/H circuit circuit 21c. If I3 < I3min, it is determined that I3 is not suitable for correct measurement of a film thickness, so that the flow returns to step S3 to perform data sampling again. If I3 ≧ I3min in step S4, I3 is determined to be valid data, so that data I1 to I3 held in S/H circuits 21a to 21c are supplied to microcomputer 22. In this case, data I1 to I3 can be represented by equations (13) to (15), as described above. Therefore, arithmetic operations of equations (16) and (17) are performed according to a program set in microcomputer 22 in advance. is performed using ellipsometric parameter Δ obtained in this manner, thereby obtaining film thickness d on sample surface 9. The data of obtained film thickness d is converted into an analog value by D/A converter 24. Then, the analog value is output to a CRT or a chart printer (not shown) in the next step S8, and the flow returns to step S3. As described above, according to the present invention, both two ellipsometric parameters ψ and Δ can be obtained at the light speed if response time of photodetectors 18a to 18c is not considered. With this operation, even if an object to be measured is moved at a high speed of 5 m/sec or more, a time delay is not caused, and hence film thickness at a given point or complex index of refraction can be accurately obtained. In addition, according to the present invention, since all the optical system components associated with the fundamental measuring operation are fixed, a mechanical movable section and a magnetic electric polarizer such as a Faraday element or a KDP element are not required. Accordingly, the structure of the present invention is simple and strong, and moreover, free from the influences of an error due to changes in temperature and the like. Since a measurement amount is converted into a dimensionless value, it is totally free from the influences of changes in light amount. Moreover, since the field of vision of each light-receiving unit (photodetectors 18a to 18c) is narrowed to 0.2° or less, the influences of changes in angle of an object to be measured can be minimized. Note that the present invention is not limited to the above-described embodiment. For example, unlike the above embodiment wherein external disturbing light is removed by interference filters 17a to 17c, modulator 31 such as an ultrasonic modulator or a chopper may be arranged between light source 11 and polarizer 1, and modulator 31 is driven by modulator driver 32 so that external disturbing light can be removed by modulating incident light without using interference filters 17a to 17c, as shown in Fig. 4. In this case, however, in a signal processing system, the outputs from channels ch1 to ch3 must be synchronously detected by supplying modulation reference signals output from modulator driver 32 to synchronous detectors 34a to 34c, as shown in Fig. 5. Although in the above-described embodiment, an object moving at high speed is exemplified as an object to be measured, a stationary object may be the one to be measured. In the industrial fields of semi-conductors and electronics, the present invention can be applied as a film thickness-measuring apparatus which is lower in cost and higher in speed than the conventional apparatuses. Various changes and modifications can be made without departing from the scope of the present invention as claimed. As has been described above in detail, according to the present invention, since circularly polarized light is used as incident light, there is provided a film thickness-measuring apparatus which can measure the film thickness of a transparent film formed on a transparent glass substrate with high precision. In addition, the apparatus of the present invention can be realized by changing a calculation method using a simple arrangement wherein a λ/4 plate is added to the apparatus of the previous invention (U.S.-A-4,850,711). When the slow axis or fast axis of the λ/4 plate is matched with the transmission axis of the polarizer, light transmitted through the λ/4 plate remains linearly polarized light. When the slow axis of the λ/4 plate is rotated by 45° with respect to the transmission axis of the polarizer, light transmitted through the λ/4 plate becomes circularly polarized light. Since this is a known technique, by employing the arrangement of the present invention, the techniques disclosed in the previous and present inventions can be easily selected and practiced by only properly setting the angle of the λ/4 plate and selecting calculation formula. Figs. 6 and 7 show a third Embodiment of the invention, which can obtain correct ellipsometric parameters ψ and Δ, and can thus accurately measure thickness of an oil film even if the refractive index or the surface roughness of steel plate 9 changes while plate 9 is moving. The third embodiment has means for applying to oil surface on sample 9 two light beams having different wavelengths. It also has means for receiving the light beams reflected from sample steel plate 9 with oil film coated, and calculating the thickness of oil film from the relationship between the phase-cosine of the light reflected from steel plate 9 with oil film coated, for the 2 light beams with different wavelengths. The relationship, from which the thickness of coated film is obtained, is the difference between these phase-cosine values, for example. Before describing the structure of the apparatus shown in Figs. 6 and 7, the experiment conducted by the inventors hereof to invent this third embodiment will be explained. for the light ray having wavelength λ₂ changed in proportion to each other, as the surface roughness or refractive index of the steel plate varied slightly. where A, B and C are constants which can be experimentally determined once incidence angle φ₀ has been set. The structure of the apparatus shown in Figs. 6 and 7, which is the third embodiment of the invention, will now be described. Fig. 6 schematically illustrates the optical system of the third embodiment. The optical system includes two light sources 40 and 41. Light source 40 emits a collimated monochromatic ray having wavelength λ₁, and light source 41 emits a collimated ray having wavelength λ₂. The ray emitted from light source 40 passes semi-transparent mirror 42 an polarized by polarizer 43 into a circularly polarized ray. This polarized ray is applied to the surface of object 9 at incidence angle of φ₀. The ray emitted from light source 41 is reflected by reflector 45 and also by semi-transparent mirror 42, and then polarized by polarizer 43 into a circularly polarized ray. This ray is also applied to object 9 at the same incidence angle of φ₀. Shutter 46 is provided between light source 40 and semi-transparent mirror 42, and shutter 47 is provided between light source 41 and semi-transparent mirror 42. These shutters 46 and 47 are driven by shutter-driving circuit 48, and thus are opened and closed. Shutter-driving circuit 28 generates shutter drive signals ST, which are supplied to microcomputer 22. The light-receiving section of the optical system shown in Fig. 6 is identical to that of the optical system shown in Fig. 1. The same components as those of the section shown in Fig. 1 are designated by the same numerals in Fig. 6, and will not be described in detail. for the circularly polarized ray having wavelength λ₂, and then calculate thickness d from the phase cosines thus obtained. The digital data showing thickness d is output via output terminal 23, and also input to D/A converter 24. D/A converter 24 converts the digital data to analog data. The analog data is input from terminal 25 to a chart recorder (not shown). The operation of the third embodiment will now be explained. Shutter-driving circuit 48 opens one of two shutters 46 and 47, while closing the other of these shutters 46 and 47. More specifically, clock generator 44 generates two clock signals CL1 and CL2 which are 180° out of phase with each other. Here, two acoustic optical modulator are used as two optical shutters. Clock signals CL1 and CL2 are supplied to shutter-driving circuit 48. Circuit 48 supplies clock signal CL1 to shutter 46, and clock signal CL2 to shutter 47, whereby shtters 46 and 47 are alternately opened and closed. When shutter 46 is opened by clock signal CL1, the Helium-Neon laser beam of wavelength λ₁ emitted from light source 40 is applied to object 9 via semi-transparent mirror 42 and polarizer 43, reflected from object 9, and split into three beams by optical flats 13a, 13b, 13c and 13d. These beams are applied to photoelectric detectors 18a, 18b and 18c. When shutter 47 is opened by clock signal CL2, the Argon laser beam of wavelength λ₂ emitted from light source 41 is applied to object 9 after it has been reflected by semi-transparent mirror 42 and passed through polarizer 43. The polarized Argon laser beam is reflected from object 9 and split into three beams by optical flats 13a, 13b, 13c and 13d. The three beams are applied to photo-electric detectors 18a, 18b and 18c. Fig. 8 is a flow chart explaining the operation of microcomputer 22 used in the third embodiment shown in Figs. 6 and 7. The operation is identical to that of the microcomputer used in the first embodiment, except for the step of obtaining data about two different wavelengths λ₁ and λ₂. Therefore, it is not described in detail how microcomputer 22 functions in the third embodiment. , both contained in equation (41), we can obtain amount M of oil coated on the steel plate 9.
where f0 is not necessary a linear function. As has been described above, the apparatus of the third embodiment of the present invention can accurately measure the thickness of a thin film coated on an object even if the refractive index of the object and other physical properties thereof continuously change. Figs. 9 and 10 show other examples of the beam splitting means to be used for the four optical flats 13a - 13d as in the first to third embodiments. Fig. 9 is a glass prism consisting of two portions 50a and 50b having refractive indices n1 and n2 (n1 ≠ n2), respectively. As shown in Fig. 9, the incident light beam is splitted in the three beams ch1 - ch3 by the glass prism 50. In the similar manner, the glass prism 51 of Fig. 10 having two portions 51a and 51b also can be used. wherein φ0 and | σ1σ2 | are specific values determined by the said optical flats (13a - 13d). An apparatus according to claim 1, characterized in that said circularly polarized light forming means (1, 11, 40) includes a monochromatic light source (11), a polarizer (1) for converting output light from said light source (11) into linearly polarized light, and a λ/4 plate (40) for receiving the linearly polarized light and forming circularly polarized light. An apparatus according to claim 1, characterized in that said signal output means (18a - 18c) comprises lens means (15a - 15c) for focusing the respective light beams transmitted through said analyzers (14a - 14c) at the same focal point, pinhole means (16a - 16c) located at the focal point, and photodetector means (18a - 18c) for forming electrical signals corresponding to intensities of the light beams transmitted through said pinhole means (16a - 16c). An apparatus according to claim 2, characterized by further comprising an optical modulator (31) arranged between said light source (11) and said polarizer (1), and means (34a, 34b, 34c) for synchronously detecting the electrical signals in synchronism with an operation of said optical modulator. An apparatus according to claim 1, characterized in that said beam splitting means (13a - 13d) comprises four optical flats (13a - 13d) made of the same material, having the same shape, positioned parallel to each other, for splitting the light beam reflected from said film, into three light beams (ch1, ch2, ch3). An apparatus according to claim 1, characterized in that the light forming means includes two light sources (40, 41) forming two circularly polarized light beams having different wavelengths (λ1, λ2) and a predetermined orientation angle, to a film at the same predetermined incidence angle. ES2346004T3 (en) 2006-03-14 2010-10-07 Betriebsforschungsinstitut Vdeh Institut Fur Angewandte Forschung Gmbh Procedure for the determination of a coating on a moving metal strip.